And during my college, at the end of the junior year I worked in a mine. And, uh, I’ve got about six thousand cartoons up there, also books and papers. I didn’t write because in the corps I took mining engineering of all things and, you know, they, they graduate a mining engineer as a sort of an illiterate. I didn’t have any real art training, but when I was about twelve nad thirteen, another boy and I went to a sign painter’s house every Friday night and took lessons. I, I don’t think anybody’s continually happy, uh, except idiots, you know. You know, you have to have little moments of depression. Naturally, I’m conservative; I’m a Republican. I always was. When I did sports cartoons, I used to uh, go to fights. Uh, I just had an operation last March which was rather serious and I’m recuperating now. I’m on a very bland diet. But, uh, I’m lucky, I was just lucky, that’s all. Yeah, yeah. I, I don’t think I’m always right. But I don’t think young people are always right, either. 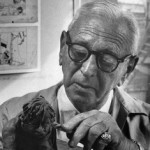 Reuben Garrett Lucius "Rube" Goldberg was an American cartoonist, sculptor, author, engineer and inventor. He is best known for a series of popular cartoons depicting complex gadgets that perform simple tasks in indirect, convoluted ways.